A solar eclipse is a natural event that takes place on Earth when the Moon moves in its orbit between Earth and the Sun (this is also known as an occultation). It happens at New Moon, when the Sun and Moon are in conjunction with each other. If the Moon was only slightly closer to Earth, and orbited in the same plane and its orbit was circular, we would see eclipses each month. The lunar orbit is elliptical and tilted with respect to Earth’s orbit, so we can only see up to 5 eclipses per year. Depending on the geometry of the Sun, Moon and Earth, the Sun can be totally blocked, or it can be partially blocked. During an eclipse, the Moon’s shadow (which is divided into two parts: the dark umbra and the lighter penumbra) moves across Earth’s surface. Safety note: do NOT ever look at the Sun directly during an eclipse unless it is during a total solar eclipse. The bright light of the Sun can damage your eyes very quickly. A total solar eclipse can happen once every 1-2 years. This makes them very rare events.s. 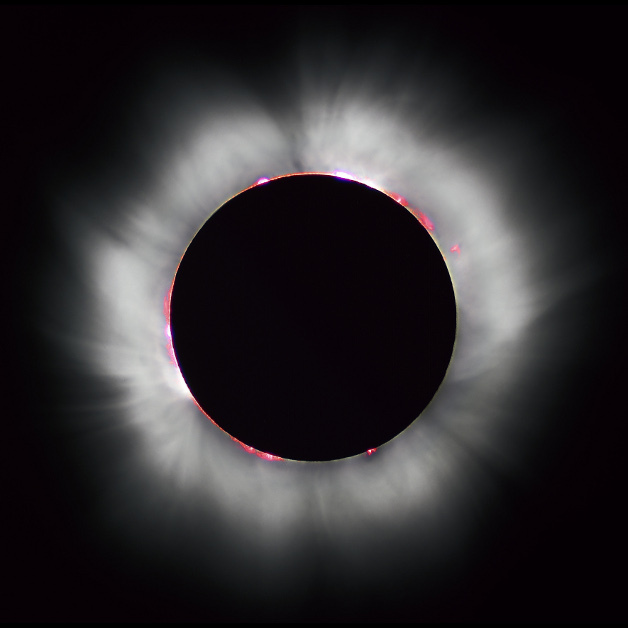 A total solar eclipse occurs when the Moon completely blocks the solar disk. In a total solar eclipse, the narrowest part of the path (where the Sun is completely blocked and the Moon casts its darkest shadow (called the umbra)) is called the “zone of totality”. Observers in this path see a darkened Sun (often described as a “hole in the sky”) with the ghostly glow of the solar corona extending out to space. A phenomenon called “Bailey’s Beads” often appears as sunlight shines out through valleys on the lunar surface. If the Sun is active, observers can also see solar prominences, loops, and flares during totality. A total solar eclipse is the ONLY time when it is safe to look directly at the Sun. ALL other solar observations (even in partial phases) require special solar filters so that you do not harm your eyes. Total solar eclipses have not always been visible from Earth. In the past, the Moon was too close to Earth and during eclipses it completely blotted out the Sun’s disk. Over time, the lunar orbit has changed at the rate of just over 2 cm per year and in the current epoch, the alignment is nearly perfect at times. However, the Moon’s orbit will continue to widen, and in perhaps 600 million years, total solar eclipses will no longer occur. Instead, future observers will see partial and annular eclipses only. Not every solar eclipse is a total one. When the Moon is farther away in its orbit than usual, it appears too small to completely cover the Sun’s disk. During such an event, a bright ring of sunlight shines around the Moon. This type of eclipse is a called an “annular” eclipse. It comes from the Latin word “annulus” which means “ring”. The period of annularity during such an eclipse can last anywhere from 5 or 6 minutes to up to 12 minutes. However, even though the Sun is mostly covered by the Moon, enough bright sunlight escapes during annularity that observers cannot ever look at the Sun directly. These events require eye protection throughout the entire eclipse. A partial solar eclipse occurs when Earth moves through the lunar penumbra (the lighter part of the Moon’s shadow) as the Moon moves between Earth and the Sun. The Moon does not block the entire solar disk, as seen from Earth. Depending on your location during a partial eclipse, you might see anything from a small sliver of the Sun being blotted out to a nearly total eclipse. To view any eclipse safely, use approved filters or use an indirect method of viewing, such as projecting sunlight through a telescope and onto a white piece of paper or cardboard. NEVER look at the Sun through a telescope unless it has the appropriate filter. Blindness and severe eye damage can result due to improper observation technique. Eclipses can occur each year, and they are predictable. There are several places online where you can get up-to-date calendars for all the types of solar eclipses. mreclipse.com – MrEclipse.com is the page of retired NASA astrophysicist Fred Espenak. He provides a wealth of information about both solar and lunar eclipses. eclipse.gsfc.nasa.gov – The NASA Eclipse Web Site is the official NASA site for eclipse information. timeanddate.com – Timeanddate is a reliable source of eclipse calendars for both solar and lunar eclipses.